Despite an aggressive crackdown on drugs, Thailand’s fight against methamphetamines is failing, activists say. With supply and demand rising, these highly addictive substances, commonly known as “meth”, are now the drug of choice. In fact, the drug in its pill form – locally known as “yaba” which means “crazy medicine” given its ability to keep underpaid workers going for long hours – has grown in popularity. A 2013 report by the UN Office on Drugs and Crime (UNODC) says in 2012 more than 80 percent of the drug users who received help in treatment centres named meth as their primary drug. Thai authorities, under pressure by the Association of Southeast Asian Nations (ASEAN) – a 10-member economic bloc – to achieve a drug-free region by 2015, stepped up efforts in 2011 to stem the upward trend of usage of meth and other amphetamine-type stimulants (ATS). Advocates warn that the drug trade has not been deterred by strict tactics that have led to staggering arrest figures, stiffer penalties for drug offences, heightened stigma for drug users, and an upsurge in compulsory drug treatment. The United Nations has criticized this as ineffective, with high relapse rates and a threat to detainee health and human rights. “The policy has no positive benefits toward drug users, and there’s no benefit to society as well, because it doesn’t actually solve the problem,” said Sakda Puakchai, chair of the Thai Drug Users Network. In East and Southeast Asia, Thailand ranked first in drug-related arrests, of which more than 90 percent involved meth, the UNODC report says. In 2012 the country was second only to China in seizures of meth pills. Thailand’s Office of the Narcotics Control Board (ONCB) revealed that in 2013 there were almost 50,000 more drug arrests and about 40 million more meth pills seized, compared to 2012. Meth has become cheaper and easier to obtain because levels of manufacturing and trafficking from Myanmar continue to increase as a result of opium eradication efforts there, advocates say. A single meth pill costs as little as US$4 on the street in Thailand. “If it’s about controlling the [illegal drug] market, it has been a complete and utter disaster,” Pascal Tanguay, a programme director with the NGO, Population Services International in Thailand, said of the government’s anti-drug policy. A 2013 report by the British Columbia Centre for Excellence in HIV/AIDS found that drug abuse and corruption is also widespread among Thai police, and is affecting the country’s war against drugs. Many drug users claim they have had drugs planted on them, have been beaten, or forced to take an unlawful urine test, or have had to pay a bribe to police officers, who have also been known to sexually assault female drug users, advocates claim. “There needs to be a policy that makes drug users feel comfortable about accessing health services,” said Tanguay, whose NGO promotes harm reduction services intended to prevent the dangers associated with drug use. Thailand is a major trafficking destination, as meth and other ATS drugs flood in from neighbouring countries – particularly Myanmar, with which it shares an 1,800km border – to feed high domestic demand. Sornsiri said she believes regional cooperation is vital in halting the illicit trade. Although meth is traditionally taken orally, an International Drug Policy Consortium (IDPC) report published in November 2013 said research in Bangkok showed that one in three injecting drug users were doing so with meth. 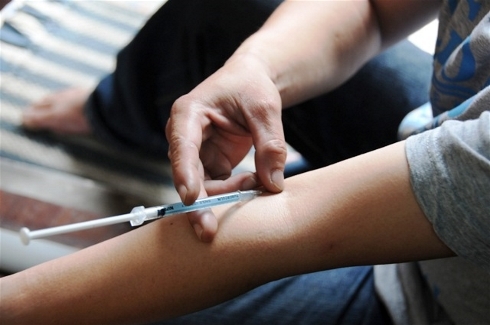 Thailand has more than 40,000 injecting users, with an HIV prevalence of 22 percent among them. However, needle and syringe exchange programmes are run by NGOs without any government funding. The number of government sites providing methadone treatment for addiction almost doubled from 10 locations in 2012 to 19 in 2013, while state-run harm reduction services remain focused on heroin users, which account for less than one percent of drug treatment visits. Thailand’s Ministry of Justice announced in August that it would consider decriminalizing kratom, a tropical tree in the coffee family that can have stimulant effects at low doses. Kratom could serve as a substitute in drug dependence programmes and help manage cravings and withdrawal symptoms.